The pinnacle of the villas at Khum Sak Tong is the Main Villa. 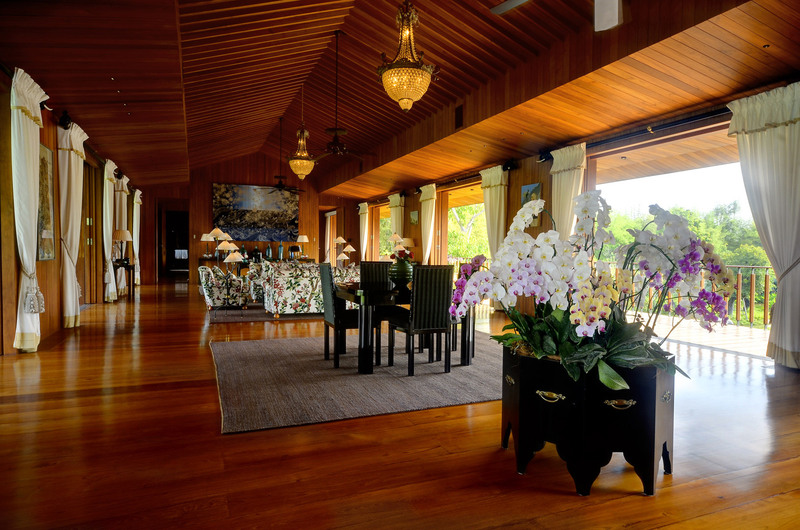 Beautifully constructed and designed with solid golden teak this is the ultimate villa to stay in. The villa is tastefully decorated with modern European furnishings and contemporary art. This is the perfect villa for a couple enjoying their honeymoon or just wanting to have a very special vacation. The Main Villa offers spectacular views of our own rice fields and mountains all the way to Myanmar. There is a tranquil lotus pond with relaxing waterfall and reading sala next to the villa. This 2 bedroom villa has over 1,300 sq. meters (10,650 sq. feet) of open living space making the villa a truly spacious and spectacular experience. Take a book form the library and sit back, relax and enjoy the afternoon breezes in the massive living room decorated with antique chandeliers and ceramics. The bedroom comes with everything you need from a large dressing area to spacious bathroom with clawfoot bath, heated floors and towel racks. The bedroom has large sliding doors that open up onto spectacular views of the property. There is a pop-up TV in the bedroom with international H.D. satellite T.V. as well as a large selection of films. Downstairs has a large entertainment area with a 70 inch LED TV to sit back and enjoy a favorite film. Enjoy your breakfast on the balcony overlooking our spectacular koi pond, stocked with handpicked koi from Japan. Have a candle lit dinner on the balcony looking out at the tiki torch-lit rice fields. Room for up to a dozen people in four villas spread out on 24 acres of perfectly landscaped gardens. 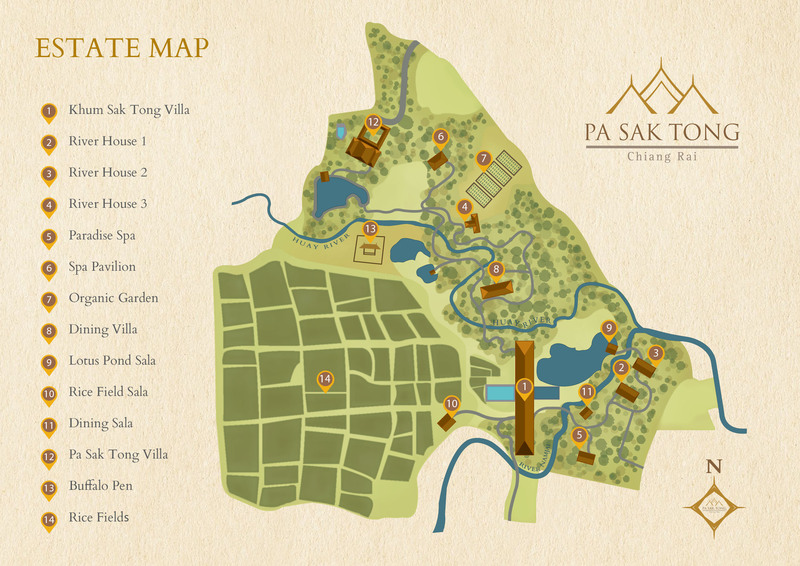 Reserve the entire estate, including Pa Sak Tong Villa and the Khum Sak Tong Villas, for a truly exclusive getaway. Our talented team is ready to help you plan a dream getaway in Chiang Rai, Thailand.